Jan's Paper Flowers: Heartfelt Creations Hoping your day is Perfect! Today is a very special day with the release of the Bear Fun Collection from Heartfelt Creations! Long days filled with sunshine begin to fade and the crisp evening breezes begin to call for cozy wool knit sweaters as the fall season slowly ushers out the lazy days of summer! Along with the falling leaves and a last surge of floral blossoms, autumn brings with it a more relaxed and reflective way of life and a reminder that winter will soon be around the corner. Autumn also brings with it a fun that only autumn can bring…playing in crisp piles of fallen leaves, picnics with warm beverages, cozy evenings spent around the campfire and exploring fields filled with rows and rows of sunflowers bowing their heads giving way to the season! Even the animals of the forest recognize and celebrate the subtle arrival of autumn, spending their last few days before hibernation playing and making preparations for the arrival of the upcoming winter season. 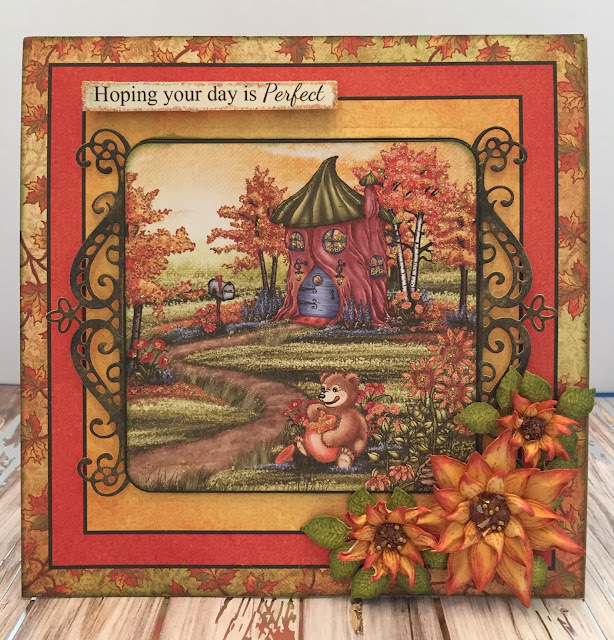 Come along with us and join in our fall festivities as we go on one final fun filled retreat with the Beary Fun Retreat Collection by Heartfelt Creations! Filled with delightful and captivating illustrations of adorable bears, this autumn themed collection is sure to appeal to all ages! Perfect for celebrating an array of occasions, this fun loving assembling of stamps, dies and decorative papers will bring a whimsical and lighthearted touch to all of your paper crafting creations. The dynamic paper collection boasts a color palette filled with beautiful tones of burnt oranges, rusty reds, midnight blues, along with leaf like greens and golden yellows all mixed with checkered plaids, decorative stripes and gorgeous imagery of blooming sunflowers and falling leaves. Three sets of detailed cling stamps with coordinating dies allow you to join in the fall themed fun of a charismatic bear family enjoying their last retreat before winter sets in. Whether sitting around the campfire roasting marshmallows near an adorable treehouse, enjoying songs strummed out quietly on guitar, or filling up on delightful meals of honey, these cute images are ideal for embellishing all of your fall themed cards and scrapbook layouts! So throw on a cozy sweater, grab a cup of hot cocoa and join in the fun as we enjoy one last “beary” fun filled autumn retreat! I'm so excited to share this card with you from this wonderful new release!!! Instructions: Create a 6” x 6” tent fold card using Kraft cardstock. Cut the card front from the designer paper pad. Using the Cut Mat Create 2B die, cut the center from the card panel. Ink all the outer edges and adhere the panel to the base using Dries Clear Adhesive. Cut the Decorative edge from the dark green paper in the paper pad using the Window Box Elements die and adhere it to the card center as shown. Adhere that center piece to the card with dimensional tape. Find the sentiment in the paper pad, cut it out, glitter it and adhere it to the card using dimensional tape. Cut another 6” x 6” panel from the paper pad and adhere it to the inside of the card. Stamp the flowers with Potter’s Clay ink, color with Harvest and Peanut Brittle, add some Rhubarb stalk to the tips and cut them out using the coordinating dies. Stamp the leaves on the lighter green paper in the paper pad using Pistachio ink, lightly color and cut out using coordinating die. Spray the flowers and leaves with Sparkle Shimmer Spritz and add Brown Gala Glitz to the flower centers. 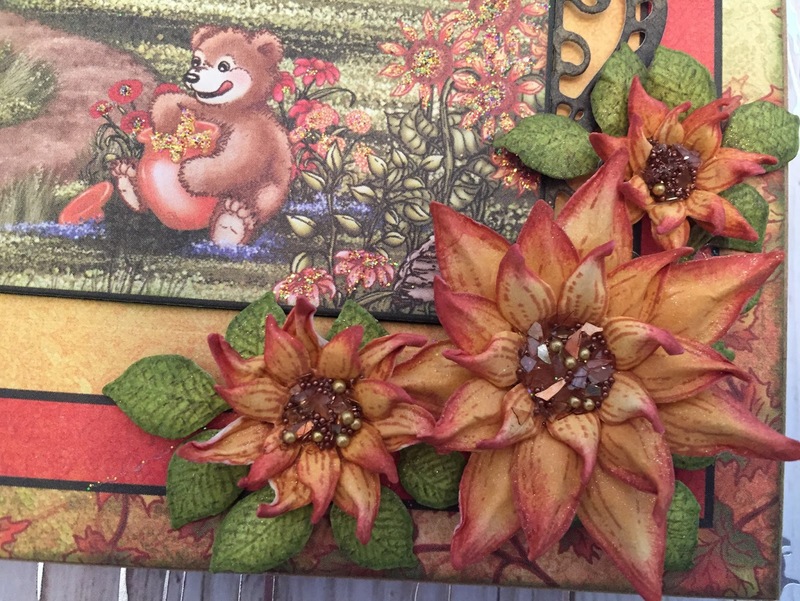 Adhere the flowers to the card using a hot glue gun. Add Lion’s Mane glitter to all the trees, flowers, honey pot and windows in the house in the image. Please leave a comment...I love reading them! This is stunning! Such wonderful colors! Thank you Glenda...I love these colors too! I love this, your flowers are gorgeous!!! Gorgeous - love the sunflowers! Oh Janet, I just love your reddish sunflowers and wow, beside your card being gorgeous, I want to hire you to write my blogs! What a lovely descriptive post!! I LOVE fall, hate summers so I am so happy to see fall coming! We can thank Tracey for all of the beautiful words! Lovely card! The sunflowers are gorgeous! !